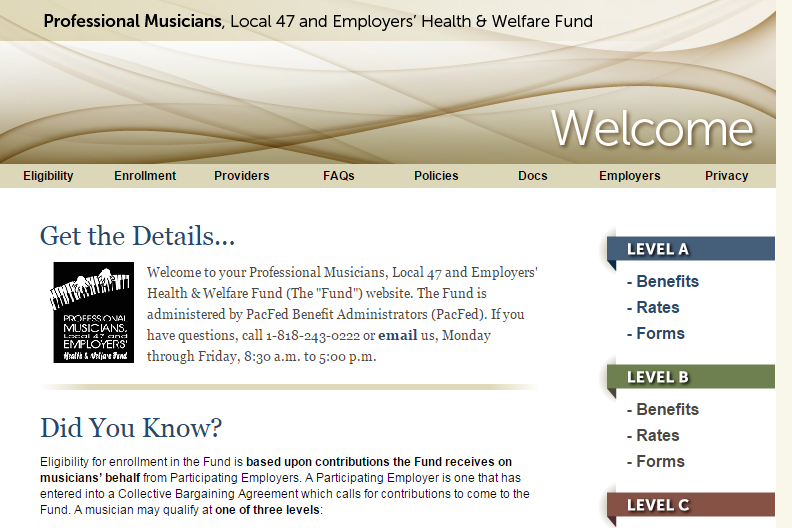 The Professional Musicians, Local 47 and Employers’ Health & Welfare Fund ‘s website, pacfed-musicians.com, contains information, documents and forms that maybe helpful to Fund participants throughout the benefit year. Most of the information is provided in PDF format to allow for easy download, to save or print. What Benefit Levels Are Available? The Welcome page shows the various benefit levels that a musician may obtain based upon contributions from a Participating Employer. A Participating Employer is one that has signed a valid AFM agreement that calls for benefits to come to the Professional Musicians, Local 47 and Employers’ Health and Welfare Fund. The Fund provides a variety of benefits and benefit options. To view these benefits select the Benefits link associated with each benefit level; here you may view the array of benefits offered to musicians who qualify for coverage under the Fund’s rules and regulations, for that level. The Schedule of Benefits is a brief summary of the various benefits sponsored by the Fund. The Explanation of Coverage (EOC) is a booklet, issued by the insurance companies which actually provide and administer the benefits, with detailed coverage information regarding the precise benefits they provide. Select the Enrollment link to view information explaining what is required to enroll and the time periods in which the Fund will accept new enrollments. Select the Eligibility link to view the Fund’s eligibility rules — such as the amount of employer contributions necessary for eligibility — and what is required of you, the musician, in order to obtain eligibility and qualify for health benefits through the Fund. Select the Rates link to view the monthly premium rates for the eligible participant, dependents. As many of you are aware, in addition to qualifying for and enrolling in the benefit plan, you must pay a portion of the premium. How Can I Contact a Fund Representative? Select the Contact link to obtain information about how to contact the Fund. The Fund is administered by PacFed Benefit Administrators, Inc. and on this page you will find the Administrator’s location, telephone numbers, fax number and email address. Where Can I Obtain the Forms I Need? Select the Forms link to find various forms required by the Fund for enrollment and “waiver of coverage.” During the course of the year you may find that you need to enroll in a previously “waived” benefit or add a newly acquired dependent. You will find enrollment forms, the Prudential Life Insurance beneficiary form and a Waiver of Coverage form when selecting the menu item Forms. On this page you will also find the HIPAA Privacy Notice and the Summary Plan Description (SPD) booklet. Select Providers on the menu to find a provider affiliated with one of the Health Net or Delta Dental plans. On this page there are instructions on how to find a provider for the benefit plan in which you are enrolled. The FAQ page has information on how to use your HMO or PPO health plan. You will also find information on Family and Medical Leave Act (FMLA), Health Insurance Portability and Accountability Act (HIPAA) and Consolidated Omnibus Budget Reconciliation Act of 1986 (COBRA). This entry was posted in Health & Welfare and tagged H&W, Health & Welfare, PacFed on June 1, 2016 by admin.